This delightful arrangement is so full of sunny blossoms, it even includes a pretty yellow butterfly who obviously feels right at home, basking in the warmth. 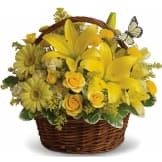 • A natural brown basket is packed with yellow lilies, gerberas, roses, button spray chrysanthemums, carnations and delicate green leaves. 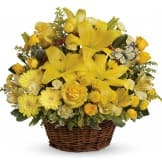 Flowers will be received by a Tom Wages Funeral Services' staff. I was very pleased with the arranagement I ordered from The Sympathy Store. It looked just like the picture I ordered from. Couldn't be happier with my order. It was exactly as the picture showed and delivered on time with a great price. My husband and I were very pleased with our "Basket full of Wishes" which we purchased from you. They looked exactly like the picture and were very beautiful. Thank you so much. The flowers were beautiful ! 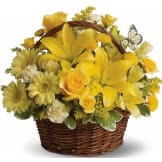 ordered this basket with a ribbon saying "Dearest Aunt". When I got to the funeral home, saw the flowers and no ribbon was attached. Otherwise, the flowers were just like the picture. 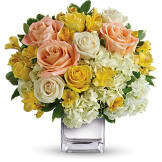 All of our flowers are designed and delivered by hand from a local florist in in Lawrenceville.